Home News NPF Re-invites Sen. Bukola Saraki again over Offa Robbery. NPF Re-invites Sen. Bukola Saraki again over Offa Robbery. 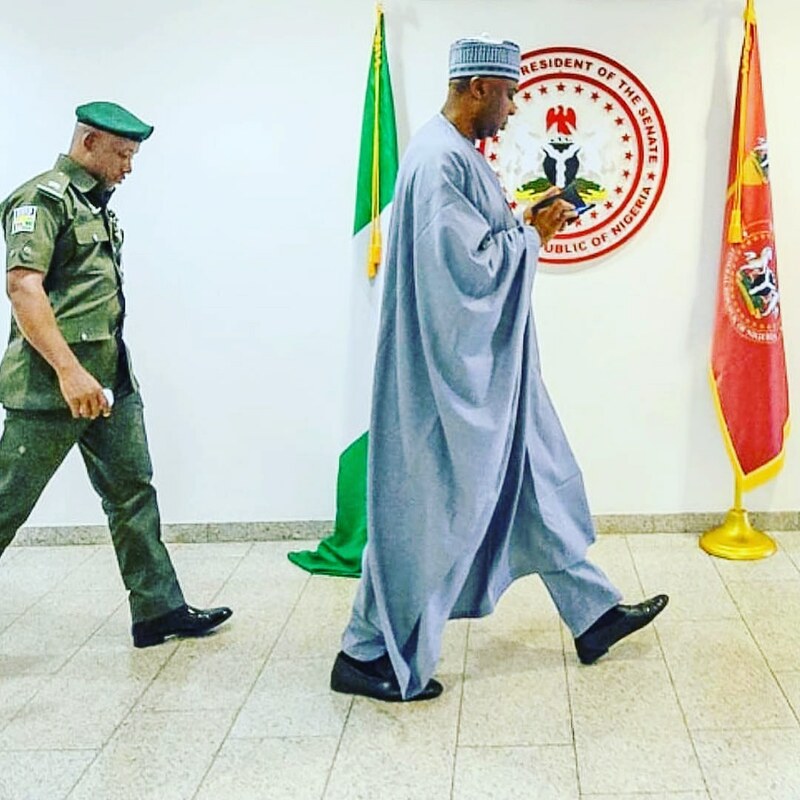 The Nigeria Police, through PRO, Jimoh Moshood, have on Tuesday, 24th July, re-invite the Senate President, Bukola Saraki over the case of Offa Bank Robbery in Kwara State. The Nigeria Police Force on this invitation have threatened to use force on Senator Saraki if he fails to honour the invitation. "The Senate President must honour Police Invitation; otherwise the Force will not hesitate to use all the instruments of the Law to ensure compliance with the law." About the alleged blockage of Saraki's residence and attempt to arrest him the police says "The Force did not besiege the Senate President residence as alleged." The Force wishes to categorically state that there was no authorised deployment of Police personnel to besiege the residence of the Senate President or his deputy as reported in the media. The police personnel seen in pictures in the media were those in the convoy of the Senate President and others attached to him. However, the Inspector General of Police has directed a thorough investigation to ascertain the facts in the episode. The Force will not allow the end of justice to be perverted by this distraction. The Senator is therefore expected to report at the Intelligence Response Team office at Guzape junction, Asokoro Extension, Abuja. - How can you invite someone who didn't go to crime scene, he didn't carry gun by himself to rob and kill people, this is just an allegation and you are inviting him,those are the thugs used by buhari in 2015 general election, you have to leave saraki alone,we are tire of buhari hardship. - Big NO! to the allegation that our democracy is under attack! How wicked are we to ignore the Offa bank robbery victims and glorify the perpetrators! Is it because our loved ones are not involved or because it served the political interest of those against Baba's government, Saraki inclusive! Let the rule of law prevails in dis matter. - Few days after the Offa bank robbery the Nigeria police invited the Senate president to come and clear some issues as regards to the allegations that the robbery was sponsored by him. Few days after that invitation we heard that the Senate president's appearance was no longer required but a written explanations from him will do. Why is the invitation all of a sudden resuscitated today that the Senate president planned to defect to the opposition party?